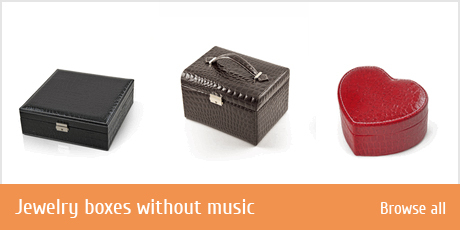 The Reuge Company has been an authorized dealer of music boxes since 1976. 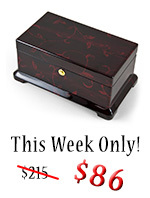 However, the first Reuge music boxes were created well before that time. In 1865, Charles Reuge settled in Switzerland to make musical pocket watches. Over the years, with the help of family members and investors, Reuge developed into a mechanically advanced company while still preserving its traditional values and designs. Charles Reuge's son, Albert, opened a music box counter for selling Reuge products in 1886. Somehow, the company survived through the war and subsequent economic crisis and built the Reuge Factory in 1930, which is still in use today. By 1983, Reuge Music USA Ltd. was established and it merged with the well-known music box design company Sorrento Specialties. With their collaboration, finely crafted Italian music boxes and other musical collectibles were formed. Today, the Reuge Company makes some of the most unique and appreciated music box styles on the market. Some options include classic, crystal, glass, inlaid, miniature, picture frame, jewelry, children's, and functional music box designs. 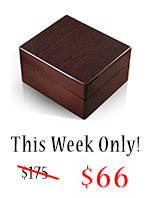 You can find a great selection of exquisite Reuge designs here at Music Box Attic. 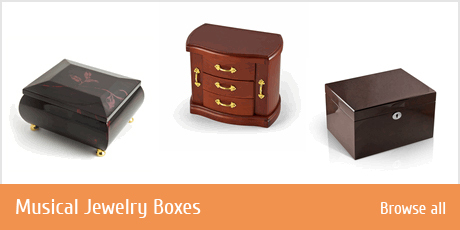 Some popular choices of Reuge music boxes that we carry include the Mandolin Grand Piano, Curved Violin Box, Musical Jewelry Box with Dancing Couple, and the Large Arrabesque Music Box. Mother-of pearl and abalone shell music boxes are another unique choice for design materials. 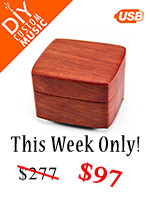 For an impressive listing of Reuge music boxes available here at Music Box Attic, you can browse the Reuge category on our website. Incredible Beveled Crystal and Elm Swiss 3 Part 72 Note Reuge Music Box - "Volga"